The test method used for this review is mainly aimed at the overclocking performance of these DIMM’s, as RAM performance scaling is pretty much a linear given fact, and overclocking doesn’t do much for gaming anyway. Per memory timing set I tried to find the maximum clock speed frequency possible, on 1.5V and 1.65V. The downside of the Intel Sandy Bridge platform is that it works with a limited overclock range due to a small BLCK frequency on most CPU’s. This means that, when setting the divider for memory, I always first tried the lowest BLCK (in my case 95.7) and then worked up the speed up to the highest BLCK (in my case 105.4). In the following overclock chart you will see that some possible results are blocked by the limited BLCK range, those limitations have been implied with a question mark, as the rest of the frequencies either passed the SuperPi 32M test, or didn’t. 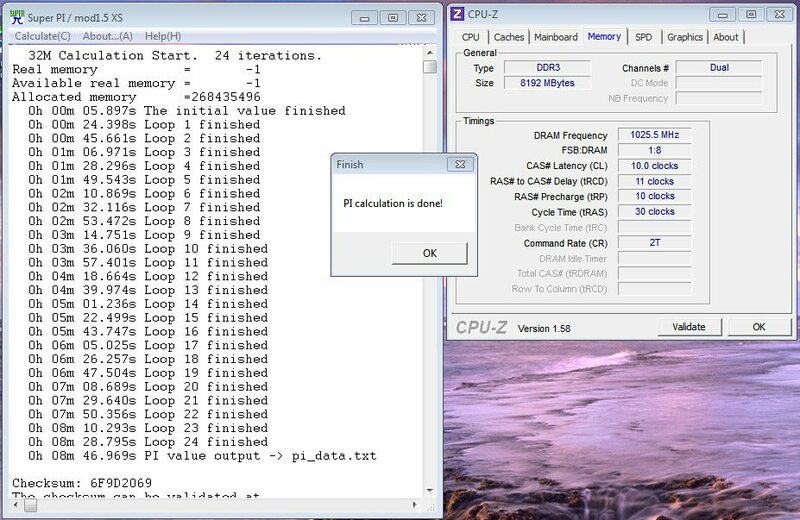 First of all, I found that most of the highest frequencies per timing set were limited by the maximum BLCK of the CPU. When switching to a higher memory multiplier and lowering the BLCK to its lowest option, most of the results failed, except for the EVO Corsa DDR3-2050 CL10 result. I found that there is minimal voltage scaling with these DIMM’s, meaning that it barely matters whether they’re run at 1.5V or 1.65V. 2x4GB DDR3-1866 EVO Corsa: DDR3-2050 CL10-11. This was actually the maximum I could get out of the DIMM’s, with respect to the maximum 24/7 usage voltage. This said, the DDR3-1333 CL9 sets have the best overclocking capabilities, compared to their typical frequency. 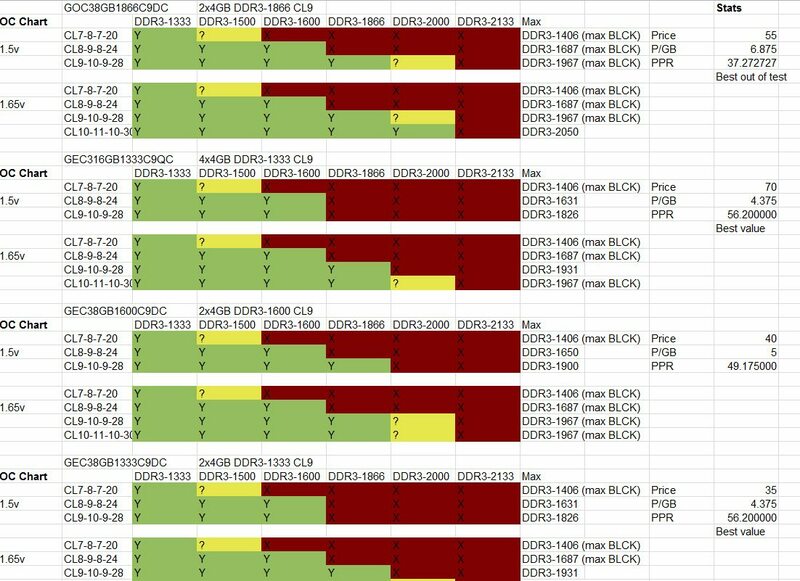 The DDR3-1600 CL9 set has slightly more potential than the aforementioned, and the EVO Corsa set is in a higher league by passing the DDR3-2000 mark, but not beating the rest by much. Important note: My overclocking results are no guarantee that you will achieve the same or better with given RAM sets. This depends on many hardware-related factors, most importantly the IC’s (RAM chips) used by GeIL on the sets. The last can change over time with a new RAM batch, so newer or older sets might clock better or worse, depending on the quality of the IC’s used.